I recently started subscribing to the Alexander McQueen website's mailing list, and every time I open an email, I wonder what kind of extravagantly beautiful yet totally unaffordable gem it will contain. 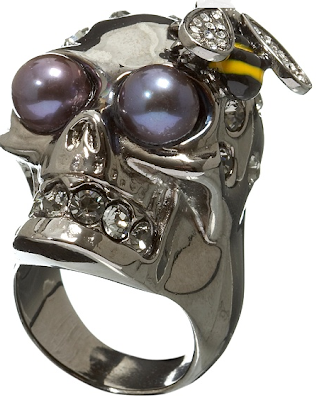 So when I got an email about his skull cocktail ring, I clicked through out of morbid curiosity (pun intended). I was expecting something north of $1,000, so I was pleasantly surprised to see the actual price: $330--definitely not cheap, of course, but a veritable bargain by McQueen's standards. As for the ring, it's definitely a statement-maker: oversized, with pearl eyes and Swarovski crystals at the mouth and the bee's wings. I'm also glad skulls aren't so trendy anymore (remember when they were plastered on everything from socks to bermuda shorts?) --thus the ring just looks badass, not fashion victim-y. This is definitely the type of accessory that could become a signature piece. Maybe it can become mine.